Hundreds of migrants broke through a Bosnian police cordon earlier on Wednesday and blocked the Maljevac border crossing, hoping to pressure neighbouring Croatia to open its frontier and let them travel north, Bosnian authorities said. Thousands of migrants and refugees fleeing wars and poverty in Asia and North Africa are sleeping rough in impoverished Bosnia, and many are growing concerned about the onset of cold winter weather and a lack of adequate shelters. Most of them want to travel onwards through Croatia, heading to wealthier European Union countries. 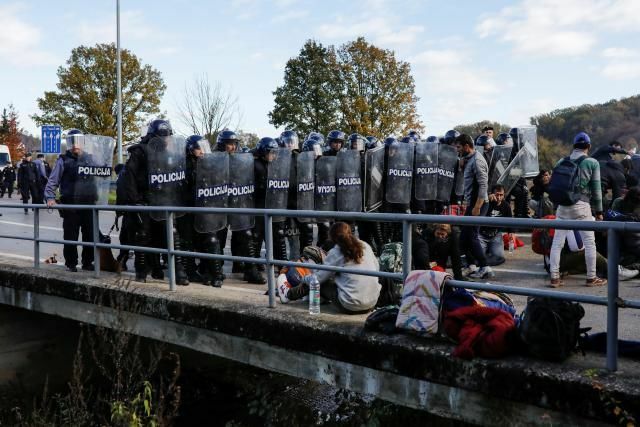 #Several people were injured on Wednesday as #migrants demanding to cross Bosnia’s #northwestern border threw stones at Croatian police who #responded by firing teargas and using #batons to push them..
As the migrants blocked the border post on the Bosnian side, Croatian police wearing riot gear put up a fence to block their passage and formed a cordon. Eight police vans were parked behind the border and a helicopter hovered above. Some of the migrants hurled stones and scuffled with the police, who responded by using teargas and batons. A woman sustained head injuries and was taken to hospital, along with another injured man, the Reuters photographer said. Two policemen were also slightly injured, a police spokeswoman said, and Prime Minister Andrej Plenković announced the deployment of reinforcements in the area. “Croatian police will protect the border, but at the same time fully respecting international, humanitarian and our own laws,” he told reporters. The migrants, including families with small children, had spent two nights sleeping rough close to the border. On Wednesday, they pitched their tents and laid sleeping bags on the road, which was closed to traffic. About 16,000 migrants, most from Afghanistan, Pakistan, Iran and Morocco, have passed through Bosnia this year. Some 5,000 are estimated to be stuck in the country, mostly in the towns of Bihać and Velika Kladuša near the Croatian border.